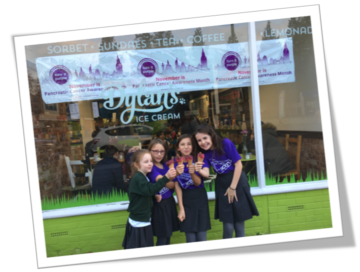 Haslemere’s favourite ice cream hang-out, Dylan’s Ice Cream, is taking part in Pancreatic Cancer Action’s ‘Turn It Purple’ campaign this November for Pancreatic Cancer Awareness Month. 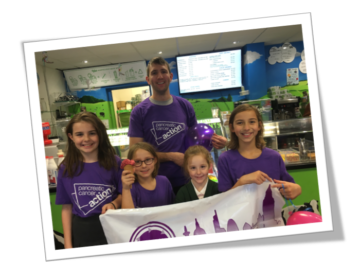 Ben Govier, owner of Dylan’s, has created a purple ice-cream to help raise funds and awareness of what will soon be the UK’s 4th biggest cancer killer. 50p of each scoop of the delicious raspberry and blackberry ice-cream will go to the charity. 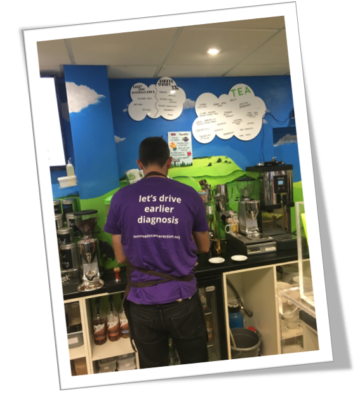 Pancreatic cancer suffers from a chronic lack of awareness across the UK. A survey commissioned by Pancreatic Cancer Action (carried out by Research Now) showed that only 6% in the UK claim to know a lot about pancreatic cancer. The South East had the highest awareness in the UK with 16% knowing a lot about pancreatic cancer. Turn It Purple is Pancreatic Cancer Action’s flagship awareness month campaign which takes place every November. It is a chance for families, friends, and communities to unite to show their support for those affected by pancreatic cancer. It is also an opportunity to raise awareness of the disease which affects almost 10,000 people every year in the UK and has the lowest survival rate of all common cancers – just 5% survive beyond 5 years. The founder and CEO of Pancreatic Cancer Action, Ali Stunt from Haslemere, is one of only 1% that survive 10 years.